Earl Poole Ball is known at “Mr. Honky Tonk Piano,” a sobriquet he earned during a 20-year stint as the piano player in Johnny Cash’s band, and playing numerous sessions with The Byrds, The Flying Burrito Brothers, Buck Owens, Wanda Jackson, Merle Haggard, Jo-el Sonnier, and Buck Owens. In addition to that, plus extensive session work and work in TV and film, he’s also done work as a writer / arranger / producer for Cash, Haggard, Linda Ronstadt and numerous others. Ball’s musical journey has taken him from his native Mississippi to Texas, then to California, to Tennessee, and back to Texas. Since 1999, Ball has been a mainstay of the Austin recording and live music scene. Pianography (Tin Tube Tunes) is a retrospective of sorts, serving as a sampler of Ball’s considerable keyboard and singing skills, and takes the listener on an exploration of the many influences that have shaped Ball’s style and career. Four sides were recorded live at the Johnny Cash Bash at Austin music club Emo’s in February of 2010. Ball covers his former boss’ “Big River” in grand fashion, then tears through a pair of kickers…Roy Orbison’s “Down The Line” (also covered by Cash) and “Mean Woman Blues.” These two rockers bookend a somber reading of the gospel classic “Will The Circle Be Unbroken,” with vocals by Lisa Mills. These tracks are a lot of fun to hear and probably would have been a blast to see in person. The last two songs are from a little further back. “Second and San Antone” was recorded in 1967 and is a textbook example of rockabilly, with an enthusiastic vocal and musical performance from Ball. The closer is a 1977 Ball composition, “Flowers on Papa’s Grave,” a classic country tune that recounts a visit to his grandfather’s grave. 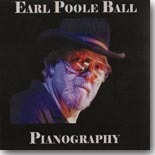 Pianography shows that Earl Poole Ball would probably have done well had he moved to the front of the stage instead of being content to play in the background. Hopefully, there’s still plenty more to hear from him in the future. All contents Copyright © 2013, Blue Night Productions. All rights reserved.